Well, you can promote the diet and then order more chelation. Win-win for a practitioner. Why didn’t you read the article before commenting? They address all your questions. I address clearly where they make this claim. See the table above? Or did you not even read that? 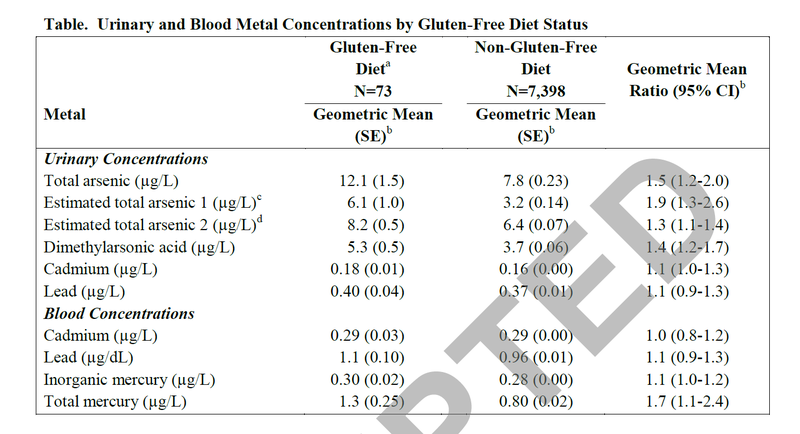 Blood mercury levels are higher in people on a gluten free diet. I’m unsure how something NOT published could actually make a “claim.” Perhaps YOU are inferring said “claim” by viewing (not reading) the data from the table (without any accompanying explanation of the sample, etc… i.e. requisite knowledge for even the most tangential “interpretation” of data). Are you inferring that because a chart was show that a “claim” is being made that the purported diet is the cause of high heavy metal levels? Or are you putting that together yourself? Again, what is the alleged CAUSE of this increase? If indeed a “study” were conducted and worthy of publication, such inference would be made as to the suspected factors for the results noted. Your article/commentary presents none – i.e., thus far conjecture. With such a skewed sample size, 100x less, don’t you want to know more about the meager 73 gluten-free diet followers? Was this a random population sampling? Was it 73 kids with autism (known for having higher levels of metals than average)? You have indeed drafted a catchy and sure to get attention headline, seemingly though devoid of merit or good conscience. Lastly, your second sentence is an overt falsehood – the GFCF diet has been well researched and proven to be advantageous to those with autism – it’s sad and professionally disappointing that anyone would dissuade families facing autism from improving the health of ill children by feeding them strategically based on exhaustive scientific research and excessive common sense (70% have GI issues). Right. The gfcf diet has been “well researched” and shown “beneficial” to autism. And you complain about the quality of the study and claims discussed above? As with many autoimmune diseases,there is a very high comorbidity of autism and celiac.You might want to look into that.I have both myself.The whole heavy metal thing is of big concern to celiacs all over the world. You mean like the conjecture that TACA infers with every dodgy study they try to pass off as evidence? No one needs to present cause to justify an observation. Take it for what it’s worth rather than build a strawman that we think it’s absolute. The body might be is expelling Mercury that was “trapped” in organs and tissues and wondering if it could be the reason of higher toxicity in urine on gluten free diet? That may make you feel better about this. Speculate why the GFCF diet makes sense. Wave your hands and feel better.